As a reminder to the driver, the seat belt warning light will illuminate for approximately 6 seconds each time you turn the ignition switch ON regardless of belt fastening. If the driver’s seat belt is unfastened after the ignition switch is ON, the seat belt warning light illuminates until the belt is fastened. As a reminder to the front passenger, the front passenger’s seat belt warning lights will illuminate for approximately 6 seconds each time you turn the ignition switch ON regardless of belt fastening. 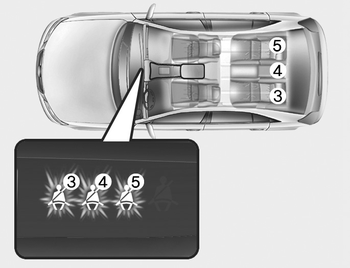 If the front passenger’s seat belt is not fastened when the ignition switch is turned ON or if it is disconnected after the ignition switch is turned ON, the corresponding seat belt warning light will illuminate until the belt is fastened. If you continue not to fasten the seat belt and you drive over 9km/h, the illuminated warning light will start to blink until you drive under 6km/h. If you continue not to fasten the seat belt and you drive over 20km/h the seat belt warning chime will sound for approximately 100 seconds and the corresponding warning light will blink. Riding in an improper position adversely affects the front passenger’s seat belt warning system. It is important for the driver to instruct the passenger as to the proper seating instructions as contained in this manual. 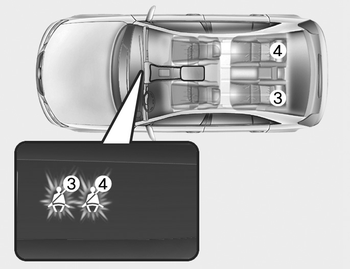 You can find the front passenger’s seat belt warning light on the center fascia panel. Although the front passenger seat is not occupied, the seat belt warning light will blink or illuminate for 6 seconds. The front passenger's seat belt warning may operate when luggage is placed on the front passenger seat. 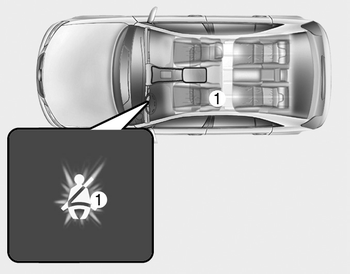 If the ignition switch is turned ON(engine is not running) when the rear passenger's lap/shoulder belt is not fastened, the corresponding seat belt warning light will illuminate until the belt is fastened. - You start the engine when the rear belt is not fastened. - You drive over 9km/h when the rear belt is not fastened. - The rear belt is disconnected when driving under 20km/h. If the rear seat belt is fastened, the warning light will turn off immediately. If the rear seat belt is disconnected when you drive over the 20km/h, the corresponding seat belt warning light will blink and warning chime will sound for 35 seconds. 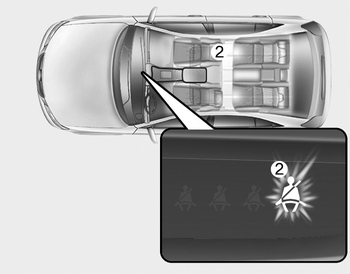 But, if the rear passenger's lap/shoulder belt is/are connected and disconnected twice within 9 seconds after the belt is fastened, the corresponding seat belt warning light will not operate.